As a longtime outdoors person, there’s one thing I’ve noticed through the years; when winter is long and cold with above-average snow, spring is often short and hot. Such was the case in East Tennessee this year. I had barely recovered from the last snowstorm when air temperatures shot into the eighties and stayed there. I continued to carry cold-weather clothing in my new boat-hauling vehicle until it became obvious it was no longer needed. I had to laugh while unloading a goose-down jacket from the back one morning in shorts, no shirt and bare feet. The hot weather was welcome until it became apparent that area water temperatures were climbing quickly and seasonal rainfall had disappeared with the lower temperatures. Furthermore, TVA had been forced to reduce water generation through dams to allow upstream lakes to reach summer pool, which meant extended periods of no flow in local tail-waters and reduced flow in many rivers. After realizing it was going to be a short, hot and dry spring the rush was on to enjoy the remaining good spring fishing while it lasted. Good spring trout fishing was the first to diminish. With reduced water flow, my favorite area tail-water soon warmed to temperatures above the trout’s preferred range and my best trophy-trout river became so shallow it could no longer be fished from a boat. My friends and I continued to catch some good trout by moving downstream toward reservoir headwaters into deeper, cooler water, though the average size and number of fish we caught was less than normal. We missed the extended period of fine spring trout fishing this year and the great night fishing for shallow-water hybrids was equally short. After several successful trips, lake surface temperatures moved into the low- to mid-80’s and larger hybrids retreated from the shallows. On our last trip to fish for them we found a few fish breaking and threw everything we had at them before finally catching one that barely stretched to the fifteen-inch minimum legal size. After that fruitless night, the spring hybrid blitz was over. Hybrids are one of my favorite fish, to catch and to eat, so I was disappointed that the best shallow-water fishing for them was over for the year. Little did I know; it wasn’t the last I’d see of Mr. Hybrid. A few weeks later, we went to a local highland reservoir on our first trip of the season to fish at night for smallmouth bass. At the first place we stopped, we found a young couple stranded in a broken-down pontoon boat in the back of a small cove. After a long, slow tow to the closest marina and safety, we returned to our starting point and started fishing. On my second or third cast into the darkness with a tiny jig and 4-pound diameter line, a gorilla of a fish grabbed my lure and bent my rod in half. I struggled to loosen my drag while the monster headed for deep water, ripping line from my reel. I was sure I’d hooked the smallmouth bass of my dreams. After a long, exciting fight, my fishing partner netted the beast in the dim light and we could see the profile of a huge fish struggling in the net; it was Moby Smallmouth. When we turned on a flashlight to admire the fish, shock struck both of us. 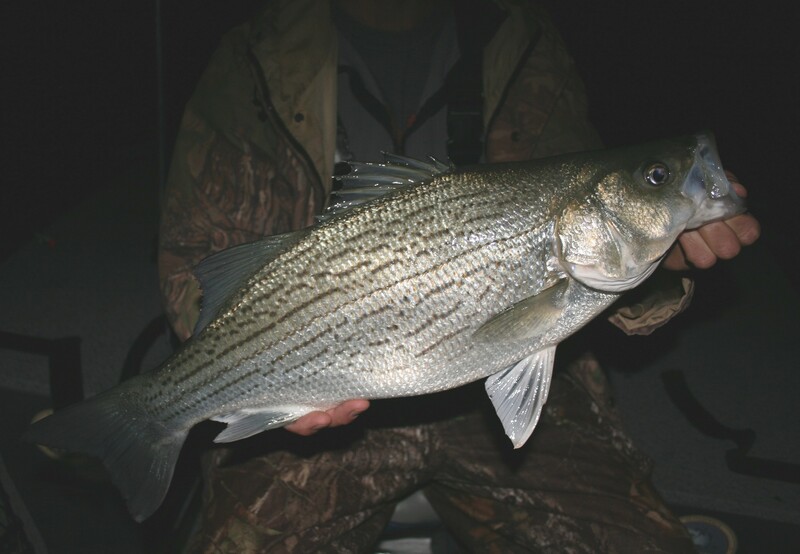 It was an eight-plus-pound hybrid striped bass; from a lake that has never been stocked with hybrids or striped bass. What are the odds of that?! We could not believe it was a hybrid. After regaining my composure, I decided that fish was a gift, a reward for rescuing the young couple from a long dark night on the lake or compensation for the shortened spring hybrid fishing. I was not sure which but was no less thankful for catching it and decided to make it my last grilled hybrid of the season. My policy is: Don’t insult the giver by not accepting and appreciating a gift. 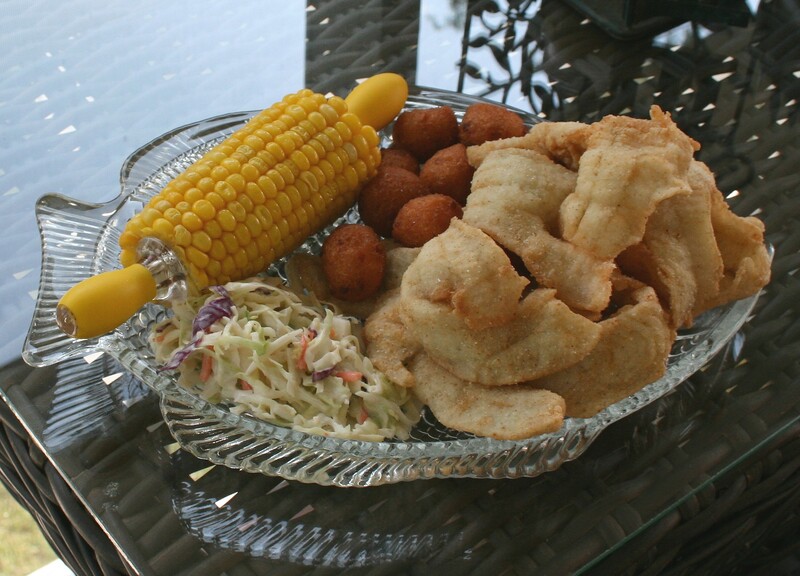 That experience, and the marvelous meals that followed, marked the end of my transition into summer fishing mode. 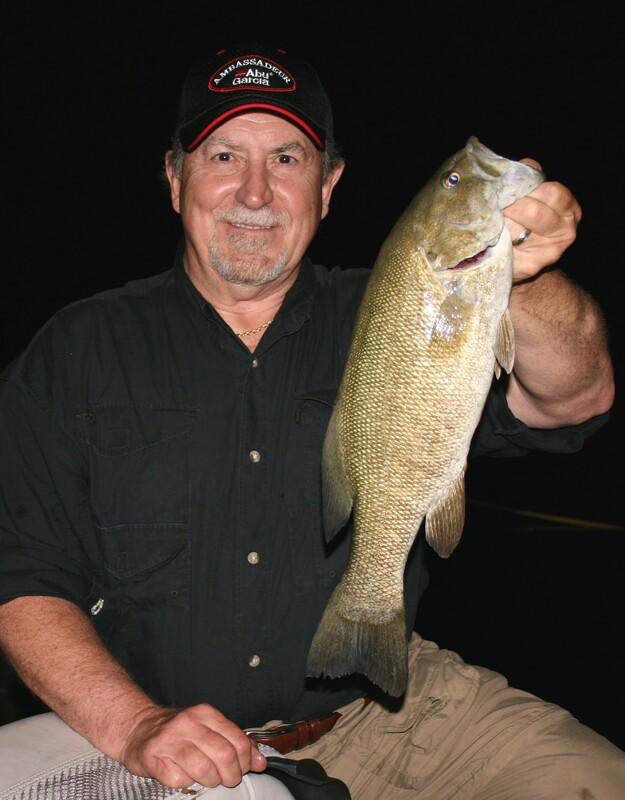 Good summer night-fishing for smallmouth bass in reservoirs is now underway. I’ve made several trips to fish for them and enjoyed success. Surface water temperatures in most area reservoirs are well into the eighties and the bass are staged on normal summer structures and feeding heavily at night, though most are holding deeper than normal. In early summer, it’s common to find smallmouths holding and active between twelve- and eighteen-feet. Most nights this is the range where you can find and catch many fish. However, it’s not uncommon to catch smaller fish in shallower water, or an occasional larger one that has moved shallow to feed, but twelve- to eighteen-feet is a reliably productive range. When fishing this depth range, it’s best to hold the boat over thirty-feet or a little deeper water. With higher surface temperatures this season, the best action has been between eighteen- and twenty-five feet. Again, we’ve caught some bass shallower including a few nice ones, but most fish caught and all the larger smallmouths have been hooked at twenty-feet or a little deeper. To fish this range without moving on top of the bass we’ve changed our holding depth to between thirty-five- and forty-feet deep. To the inexperienced, this may sound like a complicated way to fish and difficult to learn, but it’s not. 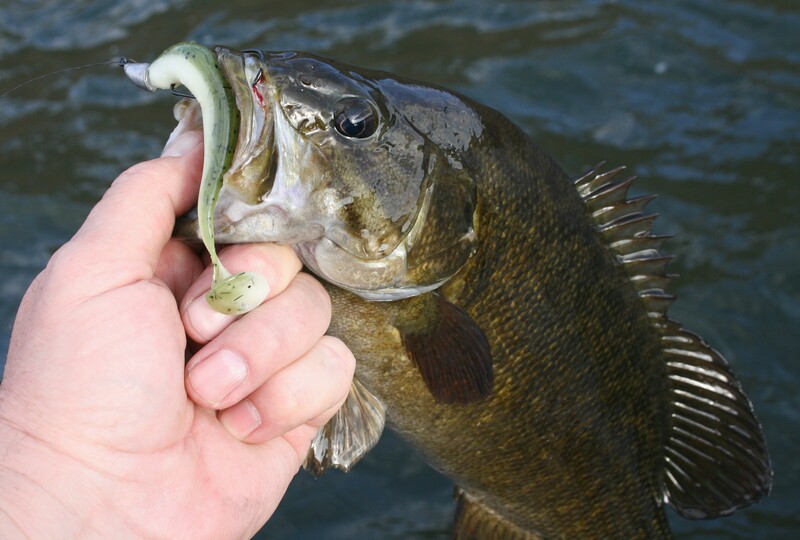 It’s a productive way to catch smallmouth bass throughout summer when boat traffic and fishing pressure are lowest and the fish are active and feeding. 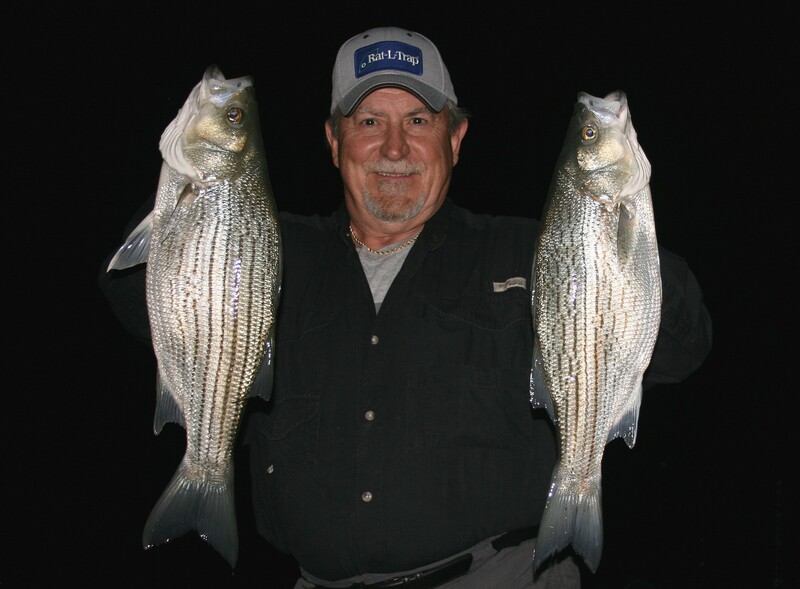 For a complete guide on finding and catching them at night on reservoirs including the approach, tackle, and lures I use, refer to the chapter on summer fishing in my book, The Weekend Angler’s Guide To Good Fishing. One of my goals this year is to spend more time fishing for panfish. 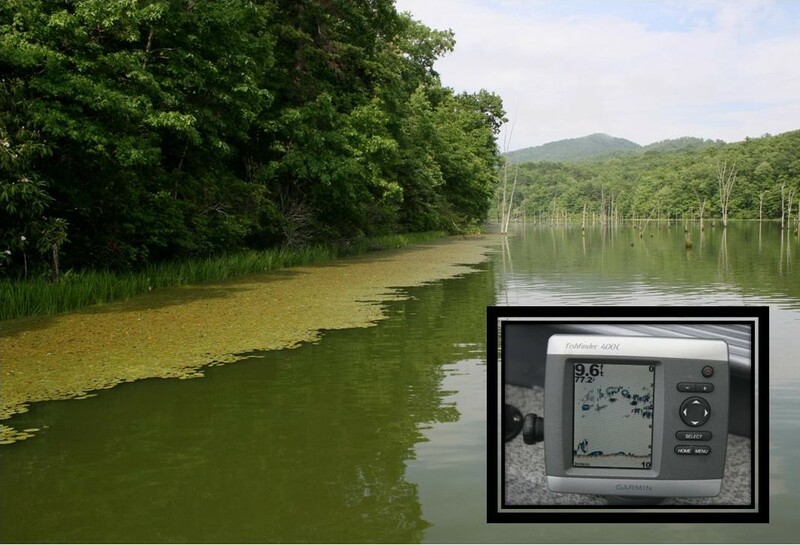 Last fall I found a tiny lake in the mountains of Southwest Virginia with a reputation for producing good bluegills and shellcrackers so when the weather began warming I bought a Virginia fishing license, inventoried and added a few items to my bream fishing toolbox, confirmed a reliable source for buying crickets and started watching the Moon phase and weather forecast. 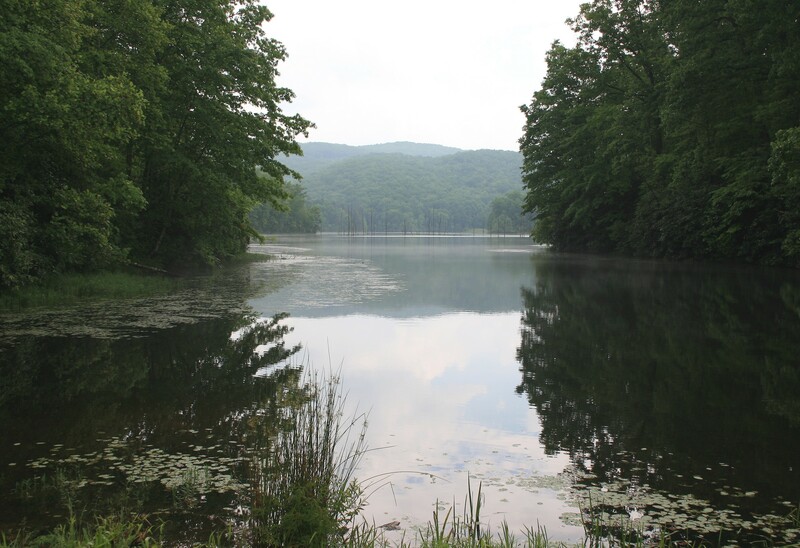 This little lake is the kind of small waters to search for when targeting larger bream and largemouth bass. It’s less than one-hundred acres, has several fresh water sources, a good mixture of deep versus shallow water, and a balanced population of panfish in various age classes including trophies. To add to the lake’s potential, gasoline-powered motors are not permitted and much of it is covered with flooded timber, making boat navigation hazardous. These features help reduce fishing pressure. A combination of thunderstorms and high winds kept me off the water during the first major spawning period of early summer but the next full moon arrived with a free morning when the probability of thunderstorms was low enough to warrant an exploratory trip. In a half day, I fished about a third of the lake and did find a few spawning beds; difficult because the water was heavily stained. The lake’s dark, tannic water reminds me of those in Ontario but recent heavy rains had dropped water clarity to almost zero. Many smaller fish were caught that first morning but several large bluegills and one nice shellcracker were included in the catch. It was enough to whet my appetite so I began making plans for a full day of fishing, despite Moon phase, as soon as my schedule and the weather forecast permitted. It was a partly cloudy, hot, muggy morning the day before a new moon when I next launched my boat on my newest fishing hotspot. Because the fish would not be on spawning beds, I’d rigged several ultralight spinning combos to help me find and catch fish. With a few crickets on hand, one was filled with fluorescent braided line and a six-pound fluorocarbon leader tipped with a small hook and split shot to present them along bottom. I also brought several tiny spoons to fish with this combo and quickly cover various bottoms depths, if needed. A second combo was set up with a drop-shot rig to present tiny one-inch Gulp Minnows a foot or more off bottom after finding concentrations of fish. A third combo was rigged with a fluorescent monofilament mainline, a six-pound fluorocarbon leader and a tiny snap for presenting small lures horizontally and closer to the surface. I had done more homework since my first visit and found a map of the lake on the Internet showing the maximum water depth and what sections held the deepest water. On my first trip, I hadn’t gone far enough out on the lake to reach the deepest water but this time went there first. When water temperature peaks in summer, many fish move to areas close to deep water so my plan was to begin fishing shorelines close to the deepest water in the lake. I moved to a point leading into a large lake arm where depth was greatest, slowed my trolling motor speed and began watching my depth finder as the boat eased along the edge of a wall of weed growth that extended several feet off shore. My first objective was to find fish and determine the depth at which they were most concentrated. The weed edge along shore varied in width and density depending on changes in bottom depth but created a vertical wall that ended abruptly at five-feet deep. Water depth outside but close to the edge varied from seven-feet to around twelve-feet. Moving far out into the lake wasn’t wise because the middle of the lake arm was full of protruding dead trees and stumps hidden just below the water’s surface. I soon learned to watch carefully and move about slowly because my boat struck hidden stumps several times. Once, after becoming a little overanxious, the boat hung securely on top of a big stump and I briefly thought swimming might be the only way to free it. But other than where a couple trees had fallen, there was an open boat lane for a long way close to shore. Before moving far, suspended fish appeared on the depth finder between three- and about five-feet deep so I quietly turned the boat, moved offshore as far as possible without crashing into wood and returned to my starting point. The boat lane continued for several hundred yards so I decided to troll a minnow imitation along the weed edge and continue the search. I’d brought several small hard-baits from my trout toolbox and chose a tiny crankbait with a green back, white belly and diving lip that would take the lure to the correct range of depths. It was a good choice because that one lure caught fish almost nonstop the rest of the day. I trolled along shore with a single rod and reel until water became too shallow or flooded wood created a barrier. Where forward movement was blocked, I reeled in the lure, moved around the obstacle or turned and began trolling back along the same path. Trolling along at a slow, steady pace of about one mph worked surprisingly well when action was added to the presentation by pulling the lure forward, then dropping line back until the lure slowed or stopped. Twitching the lure erratically produced similar results. I had many strikes doing this and soon learned not to set the hook until a fish pulled a bend in the rod. It was entertaining to troll along, suddenly see suspended fish on the depth finder, feel them begin striking at the plug and finally see the rod bend under the weight of a fish. Multiple thumps on the lure before hookups were common. 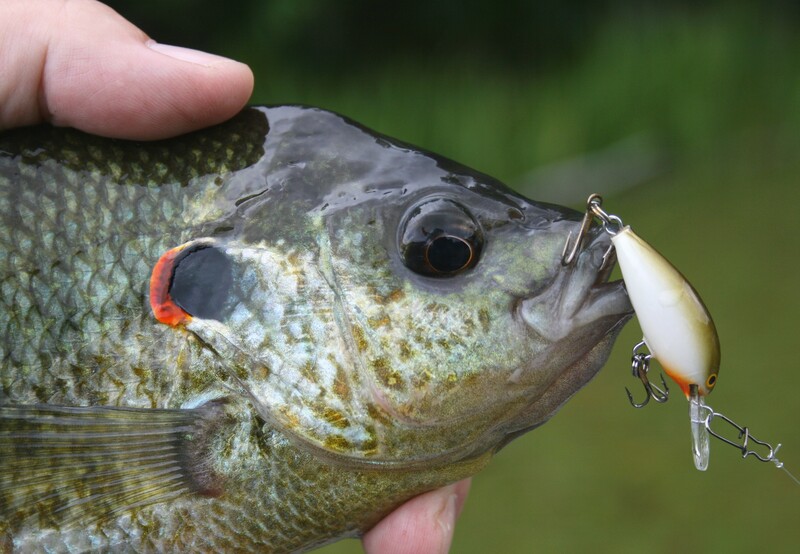 Larger bream are determined fighters and test an angler’s fighting skill on light tackle in cover. After several fish pulled free, including a couple jumbos, I decided the hooks on my crankbait were too small to hold harder pulling fish so I paused for a few minutes to inspect my newest fishing tool. 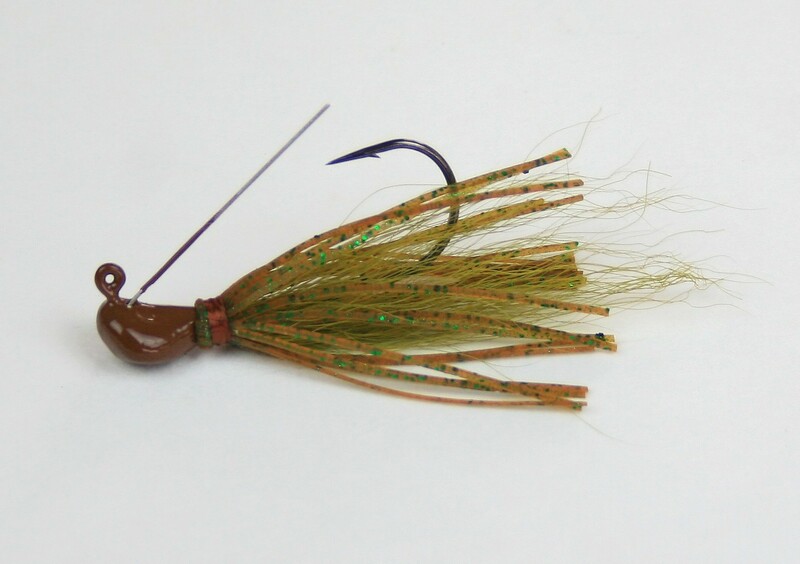 I’d brought four of these diminutive crankbaits in various colors, all the same length at one-and-a-quarter inches, and each with a tiny set of size 14 treble hooks. After a close inspection of each, I found the lure’s name on the bill of one: Ugly Duckling. I recognized the name but couldn’t remember buying or ever fishing with them. But I vowed to find and buy a couple more in brighter colors because they’re impressively effective fishing tools for panfish, run true, adjust easily when they don’t, produce a lively throbbing action, and have nice paint jobs. After studying the lure, I upsized the rear treble to a size 12 and didn’t lose another fish the rest of the day. The change made the hooks more likely to tangle but it was a minor inconvenience while trolling with a short line. Furthermore, the added weight caused the Ugly Duckling to suspend right under the surface instead of float though the change didn’t alter the lures action or running depth much because bluegills, shellcrackers and crappie attacked it equally well after the rear hook was changed. I spent most of the day trolling the Ugly Duckling, including a second color, but stopped occasionally where fish were most concentrated to present Gulp Minnows on a drop-shot rig. Where fish were holding closer to bottom, the drop-shot rig attracted strikes and produced some of my largest bluegills of the day. However, it was difficult to stop trolling when the fish were whacking those tiny crankbaits so well. A variety of mini crankbaits and minnows are available for panfish anglers today including those made by Rapala, Rebel, Yo-Zuri, and others. If you decide to try trolling for bream this summer on your home waters, choose two or three brands of hard baits that run at various depths in natural colors for clear conditions, brighter patterns for periods of low visibility and make sure each is well tuned and runs true. 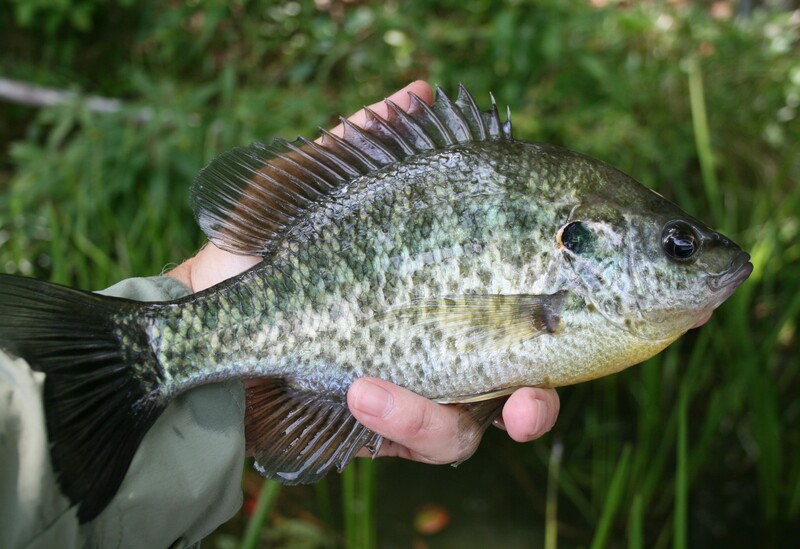 Then, go take a drive along shore close to deep water where dense cover or weed growth attracts panfish. I’m going to spend more time fishing for these wonderful fish this summer after finding a beautiful place that offers good fishing for them. Next trip, I’ll take along some slip bobber rigs, small jigs and other tools to continue my search for trophies and more fresh-fish dinners. 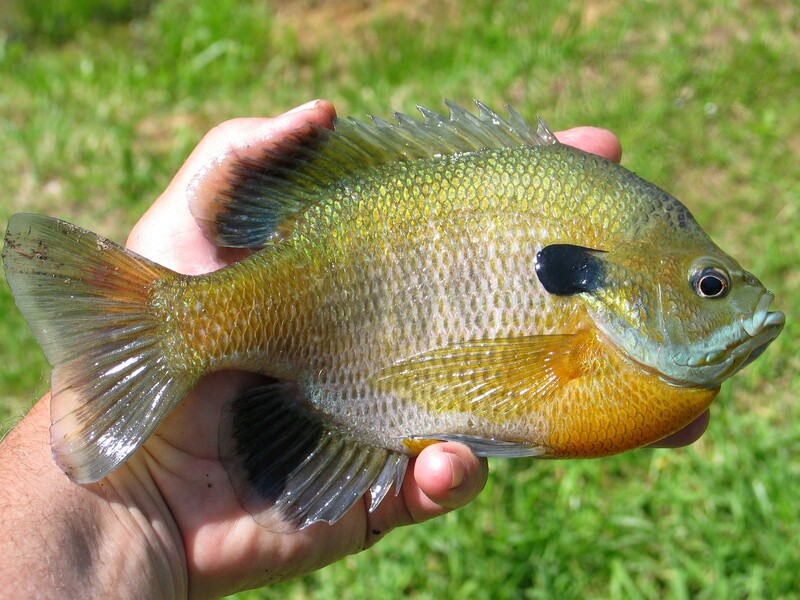 Bream are fun to catch on ultralight tackle and delicious deep fried. But if you find a special place with a good population of larger fish, keep midsize and smaller fish for the table and release the largest to conserve the resource and support continued good fishing. I didn’t think spring would ever get here. I enjoy good fishing year round but must admit that opportunities during the cold-water period can be limited, especially so when temperatures run below average, snowfall is much more frequent and winter storms continually pass through like an invading army. Global warming? Global freezing seemed a more accurate description this year. Despite the weather, I’ve kept busy enjoying some good late-winter, early-spring fishing since the Holidays with a few book-signings sprinkled in. Weather during the East Tennessee Fishing Show in Knoxville in mid-January was surprisingly good. The show was packed all four days and I met many new angling friends who were eager for the spring fishing season to arrive; not so at the West Virginia Outdoor Sports Show in Morgantown the first weekend in March. Show officials there called me the second morning of the two-day event and advised me to “Run…go South, quickly, before the approaching storm arrives.” A quick check of local radar confirmed they weren’t just trying to get rid of me. Winter Storm Titan spanked me down the Interstate with sleet and ice for most of an hour before I managed to escape, minus some of the equipment I hastily abandoned. It was a white-knuckled driving experience to start but I found sunshine and 60-degree temperatures when I arrived at home. Unfortunately, that didn’t last long. I don’t remember seeing free-flowing rivers in northeast Tennessee freeze during winter as they did this year. On better weather days, I found productive fishing for smallmouth bass and trout this winter by monitoring the forecast, water temperatures and conditions. In the last few weeks the weather has improved, temperatures have climbed and many spring spawners have started moving into the shallows. Trout provide exceptional fishing when the spring warm-up begins but one of my favorite early spring trips is for prespawn smallmouth bass in rivers. 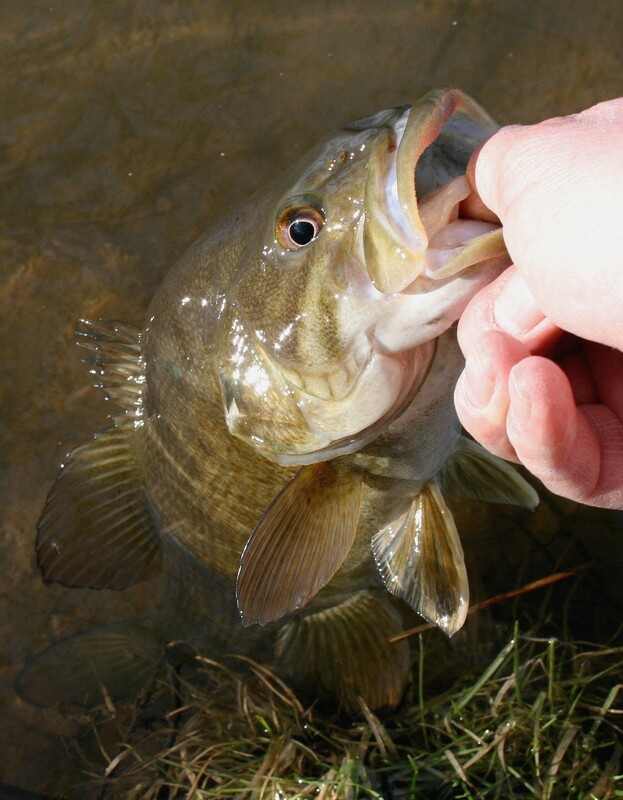 When smallies begin moving shallow in spring they become aggressive in the warming water. As temperatures rise, they begin moving to and cruising potential spawning areas where they soon develop an attitude. A combination of increasing metabolism and the drive to defend spawning sites makes them aggressive and susceptible to fast-moving presentations. Then it’s time to set aside slow-moving plastics that are so effective in cold water and pick up some hard baits. Steadily retrieved crankbaits in crawfish and baitfish colors are good choices for finding and catching fish. 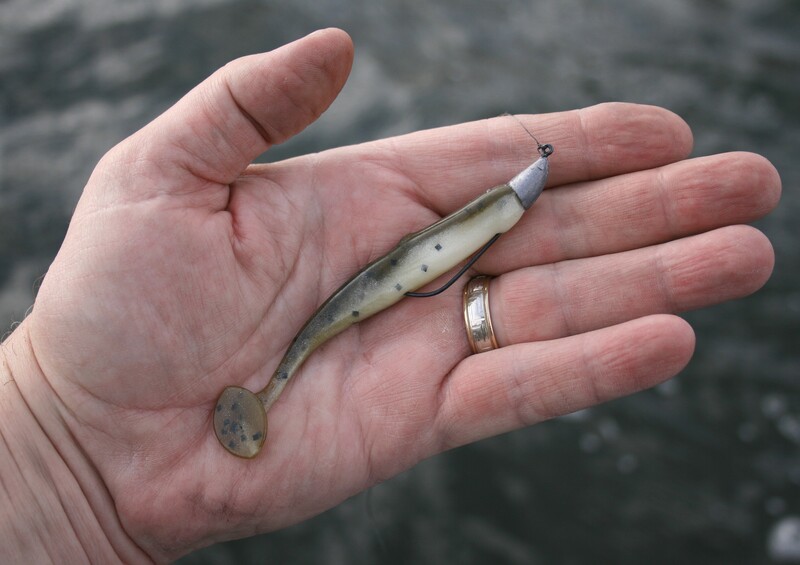 But my go-to choice in lures for prespawn smallmouth bass is shallow-running minnow lures. Minnows in the three- to four-inch range presented with fast, erratic retrieves eliminate water quickly and attract savage strikes from shallow-cruising river smallmouths. Minnow lures in natural baitfish colors work best in clear water under sunnier skies; brighter, flashier colors work best in stained water or under overcast skies. But these are not strict rules; test lure size and color until smallmouths confirm you’ve made the right choice and remain willing to change if light penetration or water clarity changes. A fast stop-and-go, darting retrieve mixed with short bursts of straight-line speed will draw many strikes after you find areas that hold fish. Find the right combination of size and color and it’s not unusual for smallmouths to be deeply hooked so bring along needle-nose pliers and handle the fish carefully to support healthy release. When rivers rise, stain and become unfishable for smallmouths, you can find plenty of good spring fishing by changing locations and species. 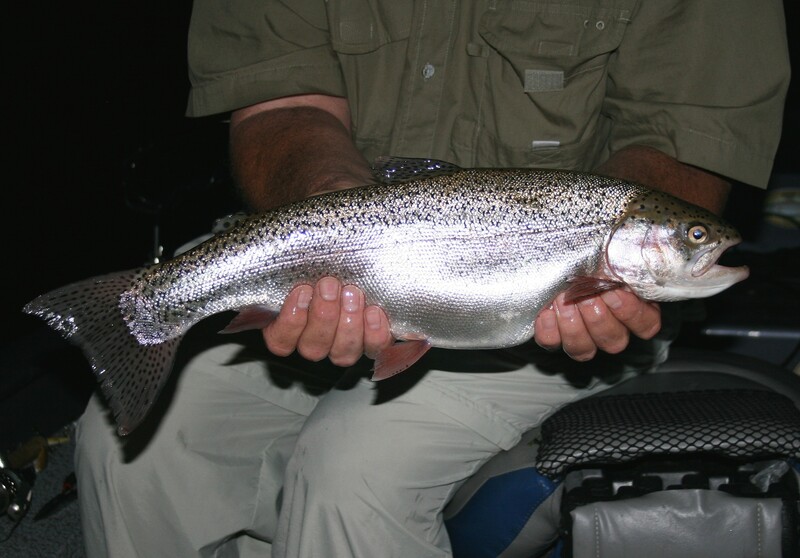 Clear water in tail-waters below dams often produces good fishing for trout, walleyes, striped bass and others, including some exceptional trophies. However, reservoirs offer a variety of excellent spring fishing if you avoid the heavy bass-angling crowd during daylight hours. Many reservoirs across the south contain alewives as a primary food source and they spawn much earlier than shad, at night, and attract a variety of game fish into the shallows in early spring. So when the alewives come up, night fishing becomes a top choice for finding large predators in shallow water. The best shallow-water walleye action of the year begins on many southern reservoirs when alewives begin spawning along rocky shorelines at night and fishing pressure on walleyes is often light. 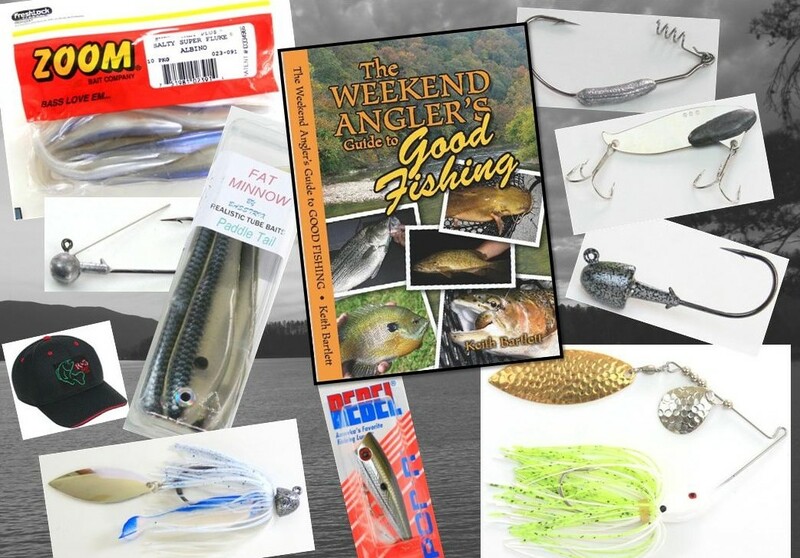 Shallow- and deep-diving minnow or shad-shaped lures, swimbaits, spinners, spoons and jigs will all take fish. Walleyes can be finicky about lure choice, color and presentation but figure out what they want and the rewards can be impressive. Walleyes rank among the best in fresh water as table fare and their average size in better southern waters would shock many northern anglers. 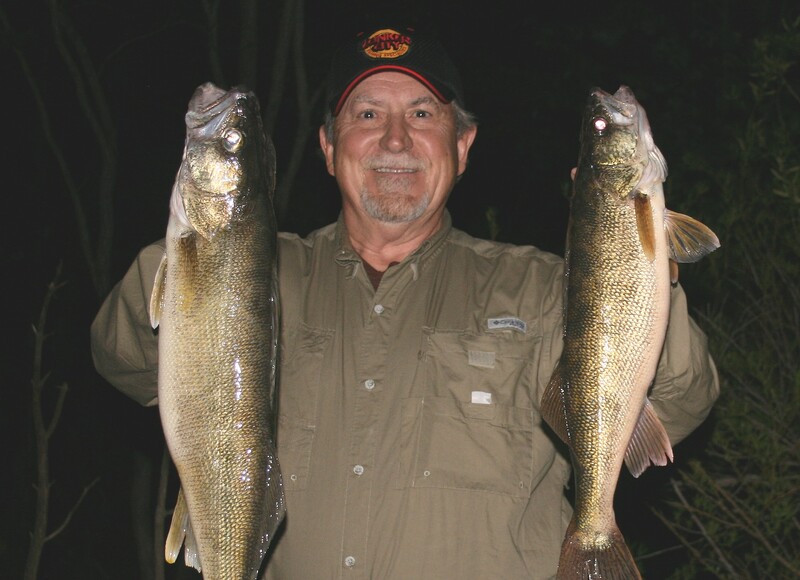 Learn much more about finding and catching spring walleyes in southern reservoirs and rivers in my book, The Weekend Angler’s Guide To Good Fishing. My most exciting adventure of the spring season so far was my first night-fishing trip to a local reservoir to check on hybrids. I’d found plenty of alewives splashing along shore one night on another lake while walleye fishing and assumed they’d be up at my favorite hybrid fishing spot. So I spooled fresh line on several rod-and-reel combos, packed my hybrid toolbox, and my favorite fishing buddy, and headed for hybrid heaven one evening as the sun set. Though I was well prepared, I had not tied on lures because I wanted to check water clarity and condition before deciding which to try first. Soon after we eased onto a place I was confident should hold hybrids, the water around us began exploding with feeding fish. I had just started loading an A-Rig with soft plastics but quickly decided that was going to take too long so I grabbed a spinning combo and in seconds had a large popping lure tied on. In the next hour, I lost count of the number of surface strikes we had. The frustrating part was that most were hits and misses though we caught and released several nice fish. I tried a variety of topwater lures in an attempt to increase my strike-to-catch ratio but saw little improvement. It seemed the hybrids would boil on most surface lures but were very selective about what they were willing to eat. I once tied on a seven-inch Cordell Red Fin to see if the fish preferred a larger-profile surface lure and caught a nice hybrid the first cast. But follow-up casts produced only boils. We were limited on time this trip and regrettably had to leave that impressive concentration of feeding fish. Trips like that will make you stare wide-eyed into the darkness when trying to sleep. A week later, my friend and I loaded our gear and headed back for a rematch with the hybrids. This trip I packed a bag of ice with a goal of catching our limit of four nice hybrids for the table. Weather patterns had been warm and stable but other conditions at our honey-hole had changed dramatically. Because the lake was still filling, with an undesirable wind direction, our target fishing area was now covered with floating leaves, sticks and other debris so our hopes for another round of incredible topwater fishing were crushed. And for some reason, warmer weather no doubt a factor, there were boats everywhere including several pleasure boaters who were there to practice doing doughnuts. To say we were disappointed is an understatement as we sat in what was previously hybrid heaven, bobbing like a cork in an avalanche of boat wakes. Though again limited on time, we were determined to stick it out to see if conditions improved and the hybrids showed. After an hour or so of casting subsurface lures, primarily Rat-L-Traps and A-rigs, we accepted the fact the hybrids weren’t yet there. And even more disturbing, there were very few alewives present to attract predators. We had agreed on a latest stopping time and were approaching the last hour when suddenly, it became windy and the other boats began leaving. Soon, the wind had blown all the surface debris by us and out into the main lake. Then, as if by divine intervention, the wind calmed and alewives began bubbling along the now clean, calm surface. Minutes later we heard the first hybrid boil and the excitement began. With less than five minutes of fishing time left, I netted our fourth fish, a beautiful five-pound hybrid. After a few quick pictures and high-fives, we headed for the ramp right on schedule. I’m looking forward to more exciting night-fishing for hybrids and walleyes in coming weeks because there’s plenty of good spring action ahead. Trout fishing will continue to improve in streams, rivers and tail-waters for numbers as well as trophy fish so I’ll be sure to include them on my schedule. Soon, bluegills will start making beds in warm, sun-baked areas and another of my favorite spring adventures will begin. It’s a wonderful time of year for recreational anglers to get out and enjoy good fishing because there are so many fish, and species, accessible in shallow water. It’s a great time to stock up on fresh fillets, catch that trophy of your dreams or introduce friends and family members to our favorite sport. If you’ve been saving back vacation time, it’s time to burn some because good spring fishing is now underway. And if you’re a die-hard reservoir bass angler, there’s no better time to get out and catch your share. Plan your time on the water under favorable weather, around major moon phases and where pressure is lowest and you too can enjoy some memorable spring fishing adventures. If you need help getting started, click on the picture of my book to order a paperback or kindle version or click the “Buy Books Locally” tab at the top of the page to find a place close by where you can pick up a copy. I hope to meet some of you on the water somewhere soon. Best of Luck! The Christmas Holiday Season has arrived along with some snow, incredible food, shopping, and special time with family and friends. It’s a busy time filled with anticipation and excitement mixed with last-minute rushes, ill people in long lines and aching feet. I love it all and elbow my way in wherever I can. With so much going on time passes quickly but soon after the Holidays, dark days, cold weather and lack of college football starts feeling like imprisonment. Most days it’s too cold to fish on large reservoirs during winter, except on infrequent mild-weather days, but brief trips to fish smaller waters can produce fine fishing and welcome breaks from winter doldrums. I’m feeling good about my prospects this season because I recently had a chance to sample one of my favorite winter pastimes; fishing for smallmouth bass in rivers. A few weeks ago, I was asked to test and recommend new colors of one of my most productive cold-water lures for river smallmouth bass, slim-profile paddle-tailed swimbaits. It was a brand I’d tested in a sample color in the past, made of hand-poured plastic in an ideal size for river fishing; the River Rock Custom Baits RR Striker. On River Rock’s Web site, Strikers are listed under the jerk-bait category as 3.75-inch baits, though in a side-by-side comparison they’re the same length as most four-inch swimbaits I’ve tried with similar diameter bodies. However, when comparing RR Strikers to other swimbaits the similarity ends when the baits are seen in motion. The hand-poured plastic of the Strikers makes them come to life as they swim, including the tail and the undulating swimming action of the body. You can find a link to River Rocks Web site further down in the sidebar column of this blog. So with the test Strikers in hand, with a box of proven favorites and the necessary rigging components, I hooked-up my boat and headed for one of my favorite smallmouth rivers on a warm, sunny afternoon. My test colors for river smallmouth bass in clear water. 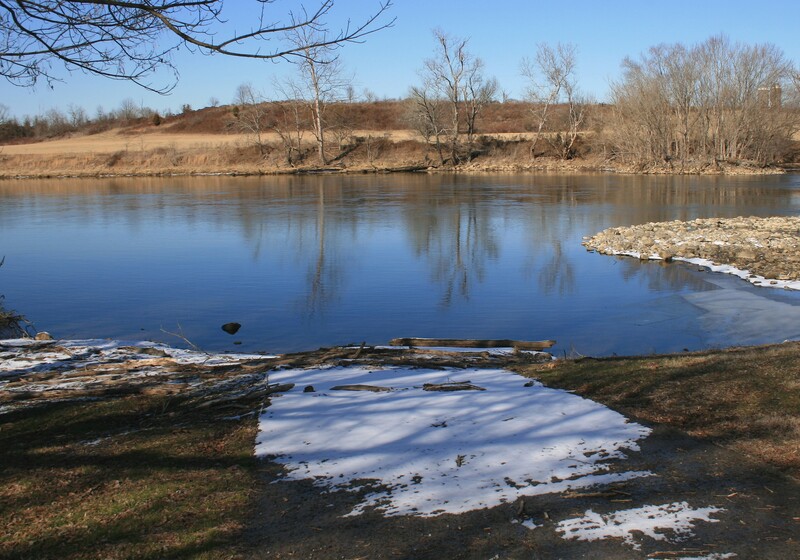 I was a little surprised when I reached the boat ramp because the river was low and clear, much like early-fall conditions, although my temperature gauge displayed water temperatures in the low-50’s. So I knew it would be a challenge to find active, feeding bass. I had chosen four colors to test; two clear-water patterns and two brighter colors for stained water. It was obvious the bright colors wouldn’t be needed so I stuffed them in my tackle bag, grabbed those I’d chosen for clear water and prepared to start fishing. On my primary rod, I rigged a Striker in Green Pumpkin w/Pearl on a 1/16-ounce Owner Ultra Head in the Bullet Style; a lighter head with a more subtle color of plastic for shallow work. On a second rod I rigged a Striker in Watermelon w/Pearl using a 1/8-ounce head; a slightly more visible color with increased weight for deeper areas. After searching several spots, I learned the smallmouths were still relating to shoals but were positioned along current breaks close to the deepest water available. On classic-looking shoals with no deep water close by, repeated casts drew blanks, even on spots that frequently hold good bass during warm weather. After narrowing my search and catching a few smaller fish, I moved upriver where a larger shoal swept into an extended area of deep water. As I moved into position to begin fishing, I found much of the area below the shoal ran from seven- to ten-feet deep so I backed away and changed to heavier heads on both rods; from 1/16- to 1/8-ounce on the first rod and from 1/8- to 3/16-ounce on the second rigged with the same two colors of Strikers. Where I fished the seam along the shallower edge of the drop I cast the 1/8-ounce, Green Pumpkin combo; along the deeper face and base of the drop I cast the 3/16-ounce, Watermelon combo. In the next hour-and-a-half, I caught several smallmouths including my largest of the day and finished with eight to ten fish landed for the afternoon. I’m often guilty of losing count of fish caught when the action gets hot and I get excited, though most times I guess to the low side. Also, I lost a couple bass and had several more strikes including a few tail bite-offs; not uncommon when fishing small swimbaits for river smallmouths. In summary, I found the RR Strikers in both colors good choices for clear-water smallmouth bass in rivers though I can’t say either was best because each caught a nearly equal number of fish. Furthermore, considering water clarity and temperature during testing, I’m confident these baits will continue attracting strikes throughout the cold-water period and beyond. Strikers are a little more expensive than some swimbaits I use in rivers but their action is unmatched and they’re more durable than most. So in a day of fishing, it’s realistic to expect to catch more fish on the same number of baits used. 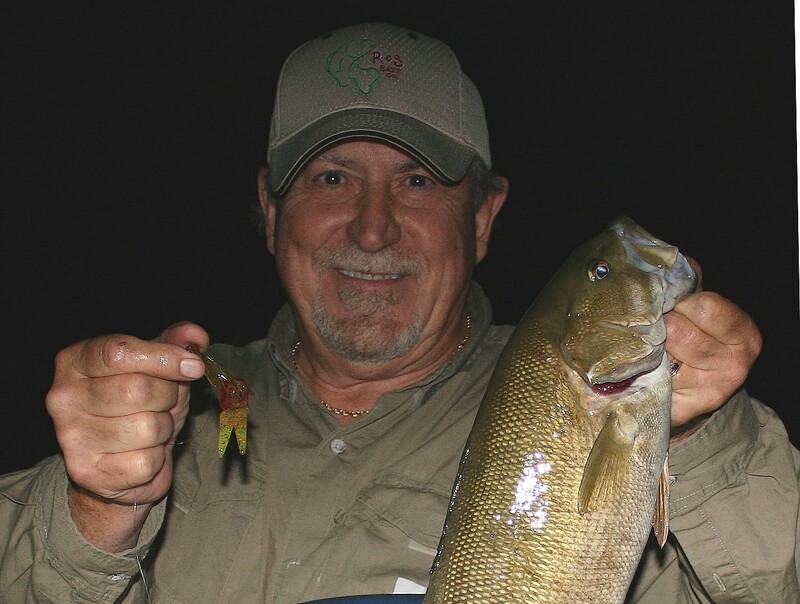 If you haven’t tried fishing slim-profile swimbaits in rivers for smallmouth bass, the RR Strikers would be a good first choice for learning and building confidence in this method of catching fish. After my first day of testing them, they’ve earned permanent space in my river-fishing toolbox. With a couple baits left in each test color, I was determined to visit the river again soon under better conditions to see if I could fool some larger bass. So one afternoon when I found some free time, I grabbed a rod and reel, my river-fishing toolbox and ran for the river to fish from shore for a few hours. What I found when I arrived changed my plans completely. Before leaving, I checked the water generation schedule on the primary river that flowed into the area I planned to fish and knew the volume of water would be greater. But as I drove over a large feeder river upstream of my planned fishing spot, I noticed that water was high and stained. When I arrived at my destination, the water level there was very high, moderately stained and the river was full of floating debris including trees large enough to create boating hazards. After having a good talk with myself about not thoroughly checking conditions, I realized I was well equipped to catch fish; just not with swimbaits. So I removed the Striker I had rigged, changed spools from braid to ten-pound-test monofilament and tied on a Texas-rigged plastic crawfish with a 1/8-ounce bullet weight pegged to the lure. 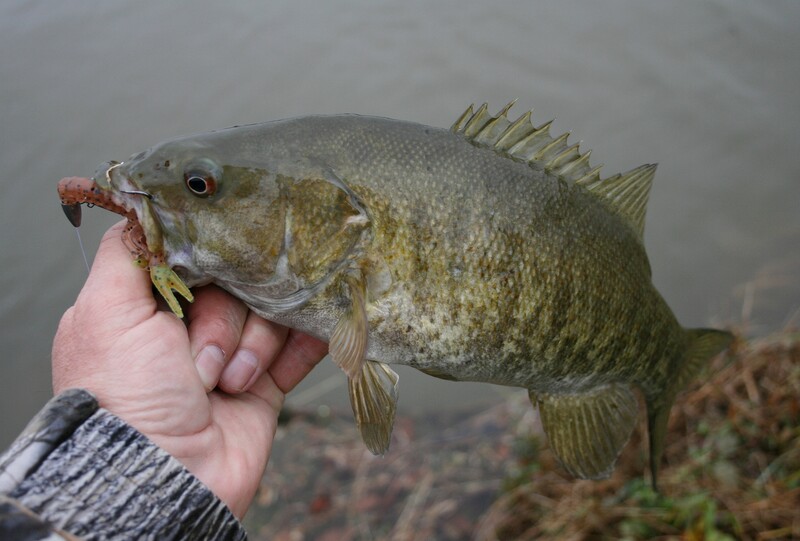 My attitude changed quickly as I re-rigged because I knew it was an ideal setup for fishing eddies along shore; one of my favorite ways to catch good river smallmouth bass during winter. Further testing of the Strikers would have to wait for another day. Before I was much more than a cast length from my car, I caught my first smallmouth bass. In the next two hours, the action was nonstop and I finished the afternoon with nine good fish. My largest bass of the day weighed more than two-and-a-half-pounds with only two fish less than a pound; a good day anytime but especially so on a cold late-fall afternoon of fishing from shore. After adjusting to the conditions, I enjoyed a productive afternoon of smallmouth fishing on a day most anglers wouldn’t consider good for catching fish. When the flow is high and swift, fish jigs, Texas-rigged soft plastics or similar weedless lures in eddies close to shore. When the flow is low to normal, try retrieving slim-profile paddle-tailed swimbaits in areas of reduced current, close to or through the deepest water in the area. 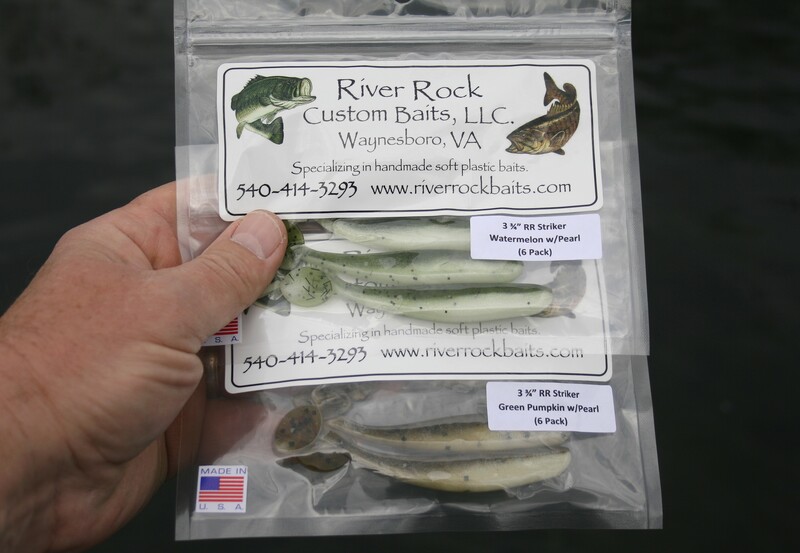 And if you haven’t tried River Rocks RR Strikers, order a pack or two and give them a try in your favorite smallmouth river. I’m sure River Rock Custom Baits will appreciate your business, and I’m equally sure you’ll be impressed with these baits. Merry Christmas to all my angling friends and I hope you have a safe, enjoyable Holiday season. And don’t forget, stop by and see me in mid-January at the East Tennessee Fishing Show in Knoxville and let’s talk fishing. You can find me there at the R&S Bait Company booth and can check dates, times and the address by clicking the Book Signing Schedule tab at the top of this page. I hope to meet you there.